In just a few months, hundreds of the world's most talented athletes will descend on Pyeongchang, South Korea, for the 2018 Winter Olympics. For those of us who have found ourselves submerged in the endless barrage of tempestuous news alerts over the course of this year, the prospect of watching the games might serve as a welcome distraction. Better yet, it could be a much-needed reminder that in the face of such global chaos, it's an opportunity to transcend the divisiveness—even if just for this purpose, just for a few weeks. Indeed, while the Olympics have always been an important display of worldwide cooperation, this underlying ethos feels especially crucial during such times of unrest. And no one knows this more than the athletes who have spent time (and extraordinary effort) competing on this particular global stage. "Every Olympics presents a tremendous opportunity for countries to unite together to support Olympians and the message that the games represent," the iconic Michelle Kwan says when I ask her about the significance of the upcoming games. As a two-time Olympic medalist and five-time world champion, the retired figure skater has plenty of firsthand experience with this dynamic of unity. "The games bring the county and world closer together. During divisive and tumultuous times, the Olympic Games is a moment when thousands of athletes will proudly represent their country in unity and acceptance despite differences of culture, race, religion, skin color, or economic status." It's a message so important at this moment, that Kwan has teamed up with Procter & Gamble and a handful of other groundbreaking Olympians to spread the word. 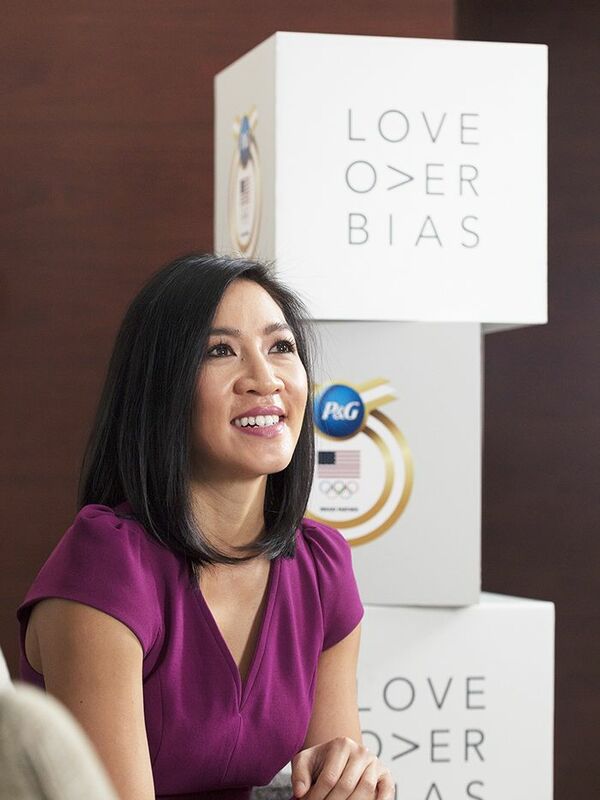 P&G recently released a video entitled "Love Over Bias" to highlight the true adversities that many athletes and their families face when working toward this lofty global stage. During a related survey, P&G found that 55% of Olympians had experienced prejudice during their childhoods—denoting the substantial resilience required to achieve their goals, as well as the opportunity to speak out from this coveted platform. Kwan is one of these athletes. "Growing up, my family didn't not have all the financial resources other skaters did," she recalls. "My family had to be scrappy—my mom handmade my costumes. I wore used skates and borrowed costumes at the elite level. Even though my parents had to work multiple jobs to put a roof over our heads and food on our table, my parents were determined to give me the opportunities I needed to get to the Olympic stage. We didn't have the resources as others, but my parents didn't let that get me down—and if anything, that made me feel empowered because I had this great support system behind me." She now uses her own story as a means to connect with young, would-be competitors who face similar circumstantial obstacles. Her advice? "To not let other people's judgments get in the way," she says. "You can only control so much, so you need to focus on the aspects that you can control rather than what you cannot." Because when you do make it, those differences ultimately fall away. "It's a unique experience, competing at the games," says Kwan. "Athletes share the same space—the Olympic Village, the opening and closing ceremonies—and we come from different backgrounds, but we share the commonality of wanting to do your best and compete at the highest level." Monumental athletic ability aside, it's a lesson worth remembering as viewers, too. Next up: Nastia Liukin opens up about what life is really like after winning an Olympic gold medal.